The Unity Performance Benchmark project contains a set of tests that use the Unity Performance Test Extension and that can be run using the Unity Test Runner. These tests serve to provide examples of how you can compile a set of scenes and tests, leveraging the Unity Test Runner and Unity Performance Test Extension, to establish performance metrics baselines in Unity for your development work, and then trend those metrics across changes. These performance tests should not be considered definitive, but rather a good starting point for you to customize and create new performance tests that are more tailored to your needs. In addition to the default command line options provided by the Unity Test Runner, the Unity Performance Benchmark project also implements IPrebuildSetup (see PrebuildSetupAttribute) where the command line is parsed for additional configuration options in order to programmatically build the player before running the tests in more varied configurations than are currently supported with the default Unity Test Runner command line options. Some of these custom command line options allow you to build the Unity Player with XR support, but they are not required to run the tests. Therefore, you have the option to run the Unity Performance Benchmark tests in either non-XR or XR player configurations. It should be noted that the test scenes were put together with the idea that they would be run against XR platforms where rendering tends to be more CPU/GPU intensive. Thus, the scenes in the project may not be large or complex enough to stress non-XR player configurations in the way you require. If this is the case for you, a good option would be to augment the existing scenes, or create new ones, that deliver the load needed for rendering in your particular situation. The image below illustrates the components used to run performance tests and collect metrics with the Unity Test Runner framework and Performance Testing Extension, then establish baseline performance metrics against subsequent metric collection. Here are the tools you'll need to start running the Unity Performance Benchmark tests. 1. Unity Installation - version 2018.1 and forward is supported by the Unity Performance Test Extension. This needs to be configured for build and deployment for the platform, SDKs, development environment, etc. 2. Performance Benchmark Tests - written in the Unity Test Runner framework using the Unity Performance Testing Extension package. The XRAutomatedTests project contains a sample performance benchmark Unity project in the PerformanceTests/UnityPerformanceBenchmark subdirectory. Download the latest released sample project from the branch/release that corresponds to the major/minor version of Unity you'll be testing against (currently 2018.1 and forward is supported). This sample project uses the Unity Test Runner framework and the Unity Performance Testing Extension. Feel free to start with this project, or use it to inspire your own performance test for your specific context. 3. 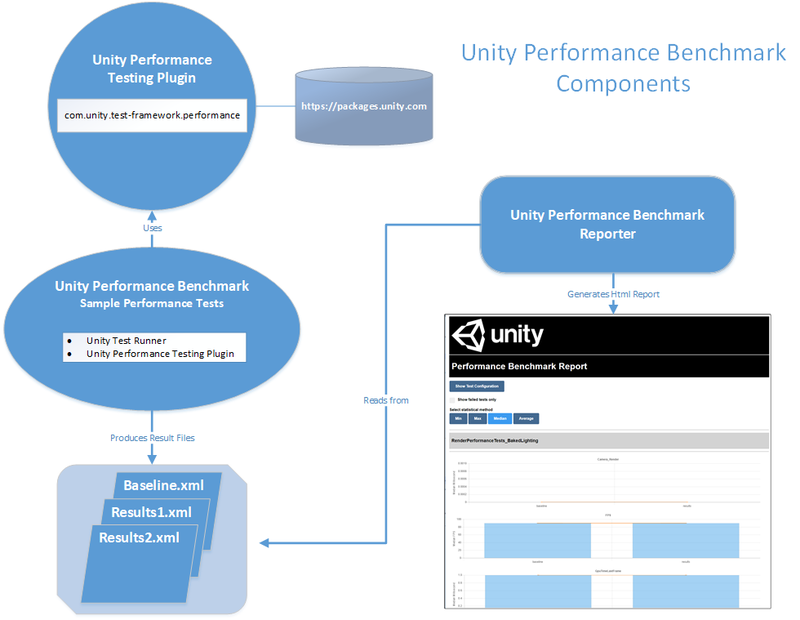 Unity Performance Benchmark Reporter - The Unity Performance Benchmark Reporter enables the comparison of performance metric baselines and subsequent performance metrics (as generated using the Unity Test Runner with the Unity Performance Testing Extension) in an html report utilizing graphical visualizations. See supported Unity --buildTarget values here. players. Values: MultiPass, SinglePass, Instancing. --mtRendering          Enable or disable multithreaded rendering. option and append '-' to disable. running tests on Android device. running tests on iOS device. and running tests on iOS device. NOTE for the -enabledxrtargets= option above, while it's valid to add multiple XR target SDK values here, with respect to running performance tests, it's more common to only add a single value here. Tip The Performance Benchmark tests are designed to be run from the command line using the Unity executable where a set of command line arguments are passed to tell the Unity Test Runner where to write the test results .xml file, where to find the project, as well as the configuration you want to build the player in prior to running the tests. You can, however, launch the Unity Editor with the same commands minus the -runTests and -batchmode command line options and then run the test in the Editor or Player from the Unity Test Runner window. This method will not create the .xml result files needed for use with the Unity Performance Benchmark Reporter. Launching the Unity Editor in this way manner is a good way to test and debug your performance test code.